Up Coming Events for Highland Meadows! The Second Thursday of every even numbered month is our Board/Business Meeting, Highland Meadows Firestation, 22 San Pedro at 7:00 pm. The first and third Thursday of every month is training at 7:00 pm. At 2:00pm there will be a meeting about our new Dumpster. Mary Anderson and Cyndi Sluder from zoning will be here to explain and answer questions. We are the first community to receive a permanent Dumpster and we will be the model the county will look to in deciding if ten other communities will receive Dumpsters too. The bids have already gone out to begin this project, there will be two big Dumpsters at the fire station with fencing around it. We will only be able to dump on the weekends and it will cost $5.00 per truck or trailer load. We will be watched very closely by the county to see how this program works here. Please come to this meeting so you can get many of your questions answered. It is hard to believe that the Fourth of July is less then a month away. Summer is flying by quickly as it does every year. We want to remind you it is not too late to be in our parade. We need every one to be involved, We have asked Cliff Hammond and Buddy Majors to be our special Grand Marshall's and Smokey the Bear will be there too. This years Fourth of July should be our best one yet. Have your children decorate their bikes, wagons, and even their horses for this parade. You will want to dress up yourself so you too look all festive and sparkly. The people wanting to be in the parade should be at Hwy 6 mini mart by 12:30 pm July 3, the parade starts at 1:00 pm. It will go down San Domingo to San Juan and end at the fire station. 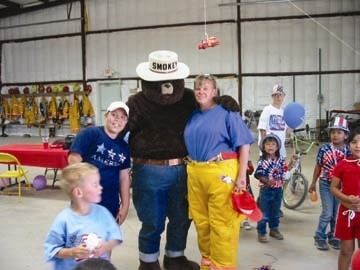 Smokey the Bear will only be able to be at the parade so all you fans will not want to miss him before he leaves. The festivities, games and potluck will begin at 2:00 pm. Please bring lawn chairs and tables if you have them to share. The fire department will also be holding a raffle to help raise money for our Christmas celebration. The children and families who took part in the Great American Clean up will not want to miss the drawing for the dinner for four and of course the movie tickets as well. In addition, to all this fun we as a community will also be honoring 2 very special people who have helped HMVFD in our efforts to become a reality. Be sure to bring your apple pies for the best apple pie in Highland Meadows contest. Judges have been picked and rumor has it that they love to eat apple pie so bring them on. Who do you think will win this contest? It could be you! Come have a good time, visit with your old friends and make new ones. The potluck should be as good as ever with all the excellent cooks we have here, so be sure to bring your appetite with you. See you There! Come Volunteer at the Fire Station, We Want You!